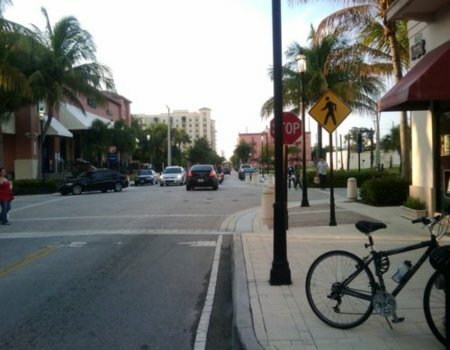 The main connection between City Place and Clematis Street in downtown West Palm Beach is that they are physically very close. Just a few short blocks separate the two. A lot of people don't know this, because the two places are viewed as separate destinations, often competing destinations. But they don't have to be, because they are basically in the same place. 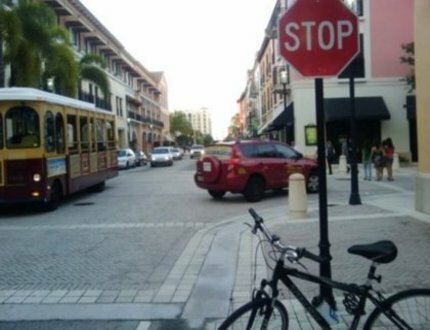 The free downtown trolley goes back and forth between them, but you don't even need the trolley because they are really within short walking distance. The below picture illustrates the above assertion. This picture was taken from the northernmost block of City Place, in front of the Fresh Greens salad restaurant. That's my bicycle on the right. The large building on the left side down the street is the 610 Clematis condominimum building, which is, of course, on Clematis Street. So this shows you how far it is from City Place to Clematis Street, not far! It's just two short blocks from City Place to the 610 Clematis condominium, and the walk takes you by Publix supermarket and the tropical Hibiscus House. The second picture below shows the same view from one block further south into City Place.